Foster homes are the most important role in rescue. We rescue dogs from local animal shelters. Sometimes the dog(s) we rescue have obviously been someone's pet, like 2018 alumnus Hagrid (who already knows his basic obedience) and sometimes you can tell the dog(s) have never felt affection or played with toys, let alone be house broken or crate trained. So our foster parents have to be prepared for everything. This list of foster resources will help you get started off on the right paw! One of the most important ingredients to a successful foster experience is your partnership with the group that you work with. These are the people who will - ideally - support you during the weeks and months that you have your dog. You should never feel alone with this big project, so make sure the group you hope to help has a good track record with solid adoptions and that they take matching foster dogs to foster homes as seriously as they take creating those final adoptions. Using drama and desperation to find homes shows up in some rescue circles, but it's not a sustainable way to do business. Avoid drama junkies. It's a good idea to look over a group's foster home contract in advance to make sure you like what you see. Will they help you with obedience training? Vet care? Your family vacations? How will they problem solve and promote? In return for being a good support system for you, your group will want to know that you're willing to follow their guidelines and instructions and that you'll be good about communicating questions and concerns that will undoubtedly come up along the way. No question is stupid - really. Ask, ask, ask. An experienced group will want to get to know you, your lifestyle and your skill level before giving you a dog to foster. They'll want to see if your personal dog has good manners and if he's comfortable with sharing his home. (Your dog doesn't have to be friends with your foster dog - but he should tolerate its presence. More on that later.) They'll also want to make sure that everyone in your household is okay with the project and willing to participate in some way, especially, with double-checking those doors and gates, and reinforcing the new house manners you'll be teaching the dog. These are some beginning need-to-knows offered to us by BR trainer Linda Chwistek. Linda is usually repping 1-3 dogs for BR. That means she's over-seeing the details of 'her' dogs' progress and making herself available to the foster homes as questions come up. Anyone who fosters with Linda learns a ton about dog training - lucky them. The dogs coming from shelters often smell bad and have fleas. You aren't getting a shiny coated, well mannered, clean house pet. You will be proud when you make him one. Fostering can be long term so be ready to make a commitment. It's fun, it’s rewarding, but it can take time to find the right match for your foster. Know you own pets and their needs. If your personal dog is 15 and wobbly, let us know so we can match up a dog that will be suited to yours. The dogs coming from shelters often have kennel cough. And sometimes they get sicker before they get better. It'll go away, but come up with a plan to keep the KC germs away from your personal dogs until your foster is well. Fosters might develop a behavior you find odd or interesting. You may find tail chasing cute, but it can be an obsessive behavior that has to be handled. Always bring up any new or odd behaviors. They could signal health issues or a behavior that needs to be addressed with training. Let you neighbors know you have a foster and if possible, have them see/meet him. If he inadvertently gets out, they may recognize him. Above: Christine Allen and her son Sam. This family fostered Vick dog 'Teddles' until he found his home. Photos: Carol Guzy, Washington Post. Being excited to bring home a new foster or any dog, for that matter, is a natural feeling. Of course we want you to enjoy all the love that your new dog has to offer, but it's important to remember that even though you are offering them a better life, they are still going through a major transition period. Your new dog will need time to decompress before they are ready to integrate into your home. Offer them a safe quiet place to relax and decompress. Below is an article from the Huffington Post, it provides detailed step by step instructions and explanations for what your new dog is feeling during this time. Though it may feel like a lot of extra steps to us, it's much better to break that transition down into smaller steps to set your new foster dog up for success from the beginning than have to troubleshoot potential issues later. The old adage, you never get a second chance to make a first impression is true for dogs too. You are better off taking dog introductions slow and AVOID a potential fight. Here's a great video about managing a multi-dog household. Select your pets with care. Some dog pairs have great chemistry while others are Jerry Springer material - Nothing but conflict and strife. Set boundaries so the dogs know and respect the house rules. Especially while dogs are getting to know each other, separate before you leave the house. Know the most common fight triggers and work to prevent them. Involve everyone in the household in multi-dog management. Understand that dog dynamics can and do shift along with life changes. Give your dogs individual attention to strengthen bonds. The majority of problem behaviors which we identify in shelter dogs are normal canine behaviors - behaviors that are not any different than those we see in owned dogs. The difference with shelter dogs is that in many cases no one has shown them alternative, more acceptable behavior. The first thing we would like to state about food aggression is that we agree with this piece from the NY Times that the food bowl assessment test is not an accurate predictor of behavior. However, oftentimes we are pulling an unknown dog and placing it within an environment with other animals. Therefore, we still preform a food bowl assessment knowing that sometimes the dog may not guard food at all when it leaves the shelter and/or a dog with no food bowl possessiveness in the shelter may exhibit it out. Is this dog dangerous? Read the entire NY Times article by clicking the above photo. Dogs with food aggression may stiffen their body, show teeth, growl, snap or bit when they are approached by a person or another animal when they are in possession of or near a food-related item such as a rawhide chew, bone, pig's ear, food bowl, sandwich wrapper, or food that was dropped on the floor. Dogs with food aggression are likely to behave aggressively around items that they consider delicious. For example, most dogs are more likely to behave aggressively over a bowl of canned food or pig's ear than over a bowl of dry food. These videos illustrate the different levels of food aggression. 1. Mild Food Aggression: Dog shows teeth and/or growls when approached or touched by a person or fake hand when in possession or near food or a food-related item. 2. Moderate Food Aggression: Dog snaps and/or lunges when approached or touched by a person or fake hand when in possession of or near food or a food-related item. 3. Severe Food Aggression tendencies: Dog bites when approached or touched by a person or fake hand when in possession or near food or a food-related item. 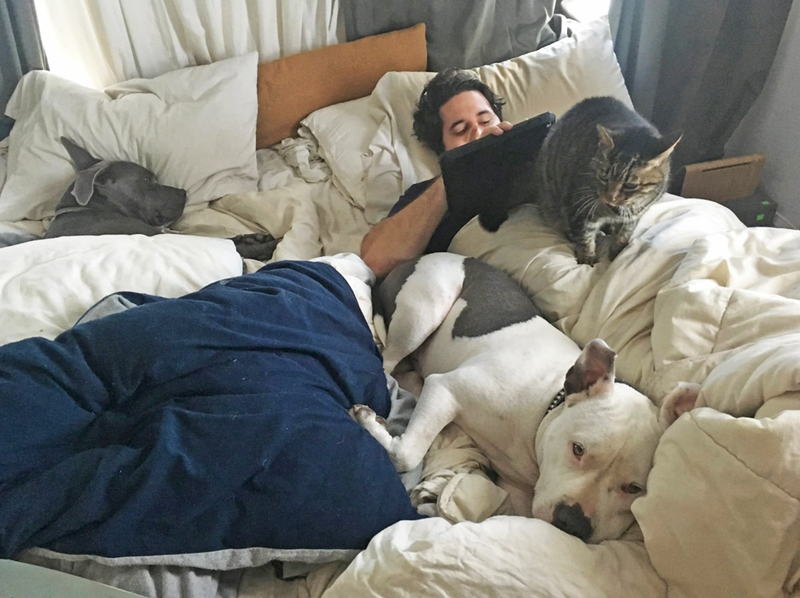 When Amy and James asked BADRAP to adopt Matzo Ball, they told us they had two cats at home, in addition to their two dogs. Would it work?